AESON, son of Cretheus, by Tyro, daughter of Salmoneus king of Elis, was also brother of Pheres and Amythaon, and father of Jason by Polymela, or according to others, Alcymede. 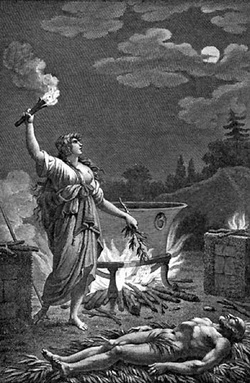 On the return of Jason from the Colchian expedition, Medea, at his request, is said, by means of her magic skill, to have restored Aeson from extreme old age to youth and vigour. Some however contend, that Aeson died before Jason came back, being forced to drink bull's blood by Pelias the usurper. Ovid, Apollodorus, and Pausanias suppose, that Aeson and Pelias were still alive at the return of the Argonauts, and that Aeson, through the debility of age, being hardly able to support himself, Jason desired Medea his wife to employ some secret art to restore him to youth and strength. On this she left the palace, and mounting a chariot drawn by winged dragons, which descended from heaven in her sight, she traversed several countries, and, gathering herbs of all kinds, composed a potion, then drew out the blood which flowed in Aeson's veins, and injected the fluid she had thus prepared. As soon as the mixture began to circulate through the old king's body, his beard and his grey hairs began to darken, the wrinkles of his face disappeared, and he recovered his pristine animation. Mythologists give explications of this fable, on the supposition that Aeson was thus restored, and that both he and Pelias were alive at the return of the Argonauts from Colchis; but unluckily these explications rest upon nothing, and the fable, which was only invented to make Medea pass for a great sorceress, has no foundation in history. Aeson had been forced by Pelias to drink bull's blood, and was dead before Jason's return; as was also his wife, who had strangled herself for grief. Pelias himself was likew ise dead before the return of the Argonauts, of which his funeral games, celebrated by those heroes, are a convincing proof. Source: John Bell, Bell's New Pantheon; or, Historical Dictionary of the Gods, Demi-Gods, Heroes, and Fabulous Personages of Antiquity, vol. 1 (London: British Library, 1790).